Two outstanding Brands..One outstanding product. A fast dinner for the entire family! Roger Wood Foods is a meat processing company that has been family owned and operated in Savannah, Georgia since 1936. Our family of employees carefully produces over a half million pounds a week of smoked sausage and other smoked meats. Roger Wood products are distributed throughout fourteen states- Georgia, Florida, Alabama, Tennessee, South Carolina, North Carolina, Virginia, West Virginia, Maryland, Arkansas, Kentucky, Mississippi, Pennsylvania and Louisiana- and we are continuing to grow. Roger Wood Foods is an SQF Level 2 Certified Company. That title sure is a mouthful, but then again so is this brunch item! 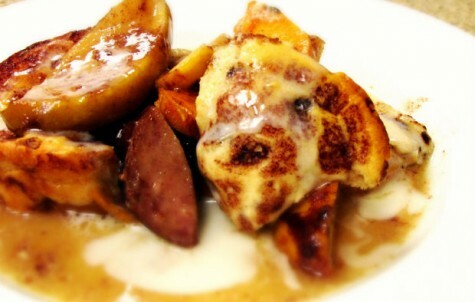 It's the perfect combination of salty and sweet with cinnamon apples and sweet potatoes and our Pork Signature Sausage.